The latest addition in the series of Panerai classic watch series is the launch of the new fashion line, Panerai Ferrari timepiece collection. 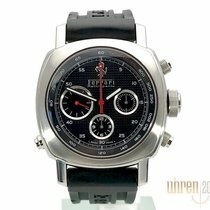 The car manufacturing giant in collaboration with the watch making company came up with a series of designer creations. The outstanding artwork of the top designers has put forth an array of luxurious and happening timepieces. 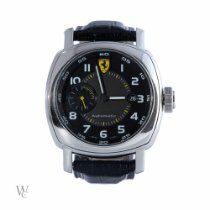 The Panerai Ferrari collection is a perfect assembly of the limited edition classic timepiece collection along with a huge range of stylish and designer wrist watches. Featuring the speed and velocity functions, it also equips the day, minutes, hour and seconds in the display field. A part of the Scuderia series, the Ferrari 10 days GMT is the latest addition in the Panerai Ferrari lineage. Supported by a P.2003/5 automatic movement, the modification has been done with the power reserve indicator. 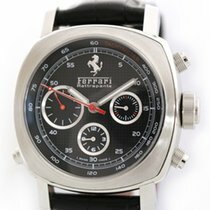 The Ferrari timepiece is a perfect wristlet for the people passionate about car racing and speed. 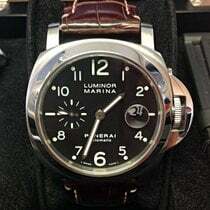 The collaboration of the one of the leading watchmakers Panerai with the car manufacturing giant resulted in the evolution of the Ferrari fashion line. The sporty look has been employed in the styling of the watches giving it a trendy style statement. One such model assimilated in the Ferrari collection is the Panerai Ferrari Granturismo GMT designed with the latest sports features incorporated in it. The timepiece exhibits the exquisite technological advances made in the horology world. Crafted with delicate designing skills, the Ferrari Granturismo GMT makes the creativity touch new dimensions with the unveiling of this timepiece. Carrying the refreshing essences of the contemporary style, the timepieces imbibe the spirit of the modern timepiece. With a case size of 45mm, the timepiece is adorned with a square shaped dial with round edges. 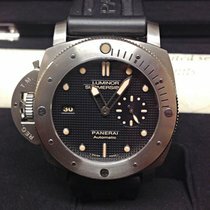 With a water resistance capacity of 100 meters, the watch houses a Panerai OP XXIV self winding movement cased in a transparent caseback. Besides the exotic design of the timepiece, the watch carries other attribute which include hour, second and minute function along with the date display function. Exhibiting the working of the movement in the timepiece, the case of the Ferrari Granturismo GMT is surfaced with a sapphire crystal glass. Following the line of the Ferrari designs, the bezels have been decorated presenting the glimpses of the Ferrari art. The watch has been provided with two crowns with the stainless case gleamed with the shiny polish. The upper crown allows the setting of the hour, minute and the GMT function while the lower crown is used for setting the alarm as well as winding the watch.